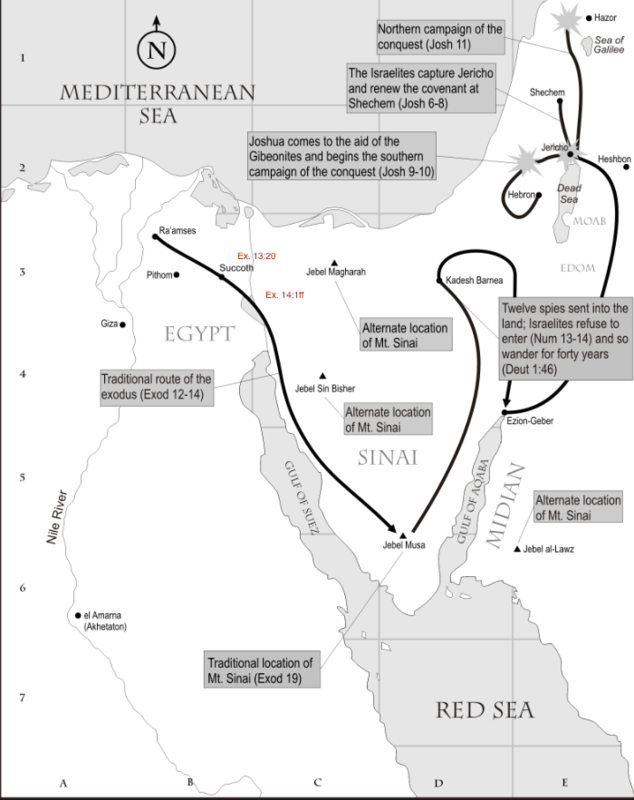 Previous Lesson… God directs his delivered children both directionally and commemoratively as they leave Egypt. Ex. 13:1ff. • Moses makes 12 appearances before Pharaoh. • There are 39 mentions of Israel’s “release” or “deliverance” in order to celebrate a festival to Yahweh God in the desert. • 7 times Yahweh predicts that Pharaoh will not listen to Moses. • In order to motivate Pharaoh to release his enslaving grip upon the Israelites, Yahweh unleashes 10 Consecutive, Pervasive and Devastating Curses upon Egypt. • 10 times the text clearly says that Yahweh God distinguishes between Israel and Egypt with respect to the plagues’ devastating affects. • Neither Pharaoh’s diviners nor his gods are any match for Yahweh’s mighty hand. In delivering Israel from Egypt, Yahweh God could be defeating as many as 118 Egyptian deities. It is also interesting to note that Yahweh’s last and greatest curse against Egypt, the curse of Egypt’s firstborn, is not just directed against the firstborn of man and beast, but also “against all the gods of Egypt” (Ex. 12:12). • Under intense national pain and pressure, on several occasions, Pharaoh will express a momentary remorse and contrition for not releasing Israel to worship. Pharaoh is momentarily contrite (3x) while admitting sin (2x) and asking Moses to prayerfully intercede on behalf of Pharaoh’s disobedience to Y. for not releasing the Israelite as commanded by Y. in order that they may fully serve Y. God in the desert with sacrifices (4x); Once Pharaoh even asks for forgiveness. • In fact, there are 17 references to the “hardening” of Pharaoh’s heart. • 4x Pharaoh unsuccessfully attempts to make bargain with God or Moses so that not all of Israel will go and worship. • So what’s the point to all this protracted salvific drama? So with this one protracted drama acted out on history’s stage, God reveals the truth concerning God and man. God is big; man is small. Though for a time, it may seem that man can be God, when man attempts to play God, he is ultimately crushed by God, and those who chose to keep God, God and man, man, or those that ally themselves with God through faith, with will not only be delivered from corrupt man, but will be rewarded for their trust. “Turn back” how, like go partially back the way they had just come from? Why here? Why go back at all? Why didn’t He tell them to stop earlier or take a more direct route, that is, if we are really talking about turning back? Or is “turn” a better translation here? Yahweh seems to be using the Israelites as bait in a trap? And why wouldn’t Pharaoh say, “The sea has shut them in”? Another “hardening” of Pharaoh’s heart… How will God be honored through Pharaoh and his army? Like a veil had been lifted? Is this a case of second-thought or buyer’s remorse…how could we have been so foolish? 7 and he took six hundred select chariots, and all the other chariots of Egypt with officers over all of them. 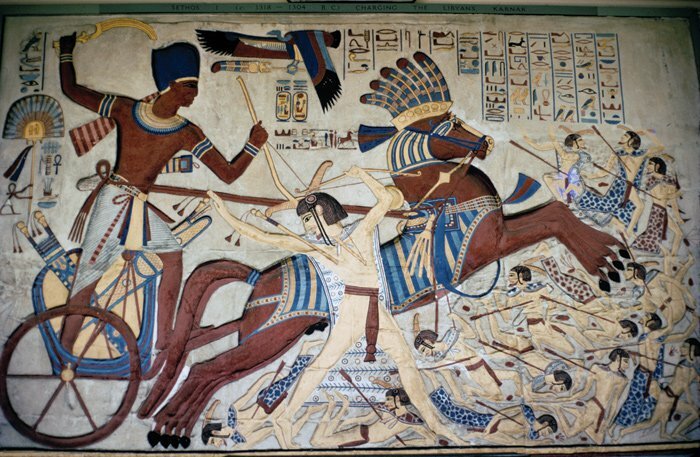 Is this the Egyptian cavalry, and is this about pursuit and speed…it has to be now, because surely an army would have eventually caught up with the slow moving Israelites? 8 The Lord hardened the heart of Pharaoh, king of Egypt, and he chased after the sons of Israel as the sons of Israel were going out boldly. 9 Then the Egyptians chased after them with all the horses and chariots of Pharaoh, his horsemen and his army, and they overtook them camping by the sea, beside Pi-hahiroth, in front of Baal-zephon. The only way to not be afraid is to see the future as safe, as having been delivered somehow, and that is only accomplished through faith and trust in the God who brought us out of Egypt to begin with. If he did what he did, he could certainly deliver us now, and thus the child of God’s greatest weapon, a weapon that the world does not have if it does not trust…if it does not believe…faith, trust, hope, loyal love, mercy…in God…my protector, my redeemer, my savior, my deliverer. Do nothing! Amazing, but at the same time, I…we…are not allowed to scream in fear. We show our faith by our silence. Can God really do something? Can he really save us from this? • Yahweh commands Moses to tell the Israelites to turn and camp near the sea in order to give the impression that the Israelites are lost or confused and therefore vulnerable to Egyptian attack. • At the same time, Yahweh will once again harden Pharaoh’s heart as he did so often during the ten plagues in order to cause Pharaoh to pursue the Israelites. In so doing, Yahweh is about to use Pharaoh and his armies to bring him further glory. • Thus when it was reported to Pharaoh that the Israelites had fled, he and his servants, immediately have a change of heart and questioning their decision to release the Israelites to begin. • In response, Pharaoh puts together his army of chariots and goes in pursuit of the Israelites. • As Pharaoh’s massive army of chariots gets closer and closer to the Israelites, they become greatly afraid, questioning and reminding Moses how they had warned him in the first place about the risk of this massive undertaking in the first place. • Moses reminds the people not to fear, but to stand firm so that they will see Yahweh’s deliverance on this day because Yahweh will fight for them if they are still. Summary… Yahweh uses the Israelites as a trap in order to destroy Pharaoh’s armies and bring Yahweh greater glory. • Once again, we do not always know or understand God’s plans or leadership. We think we know, but we don’t see far enough ahead or enough of the variables to understand the more greater and divine possibilities. • Great pride goeth before a great fall, and apparently, it is often times just as easily rebuilt or restored, even after a humiliating fall or defeat. God tells Israel to turn in such a manner that seemingly tips the Egyptians off to the fact that the Israelites really don’t know what they are doing and thus are becoming vulnerable prey to a possibly pursuing Egyptian force. In other words, Israel’s slight turn is just enough to cause Egypt to rethink its release of Israel. One slight turn. That’s all it took, and Pharaoh thinks he is back in the game—an attempt to redeem his glory, even after ten devastating and humiliating defeats. And so Pharaoh takes the bait and therefore sets in the motion another unpredictable piece of God’s greater plan, deliverance, judgment and glory. • In the face of fear and panic, leadership must stand firm. It may be all that stands in the way between panic and absolute destruction and final victory. • Better to stand still and trust in God’s deliverance that to run, screaming in fear of what may or may not happen. Thanksgiving… It’s been a wonderful week. Among many things, got to do a lot of good, intensive pastoral counseling. My Spiritual daughter continues to make great decisions as she raises her newborn in a safe place and as she continues her ongoing substance abuse recovery. She also celebrated her 26th birthday this week. Thank you, Jesus. Also had a great visit with my Spiritual support family this week concerning my own personal struggles in dealing with my mother-in-law’s ever increasing dementia. I overcame my fears and procrastination and had a good visit with her, while gathering up her tax info. Recently began reading one of my many wonderful birthday presents, a Pulitzer Prize winning biography of George Washington, and I am truly loving it. My Spiritual brother, Mike, did another great job teaching this past Sunday, freeing me up to do other studies and writing, while young Mr. Tag did another bang-up job designing worship in Shann’s absence. Now the Taco Posse has arrived to cook some tacos on Taco Sunday. It’s been a rich week. And on every cold night, which have been quite a few lately, I get to snuggle with this amazing woman and my best friend, Rhonda. I am very, very blessed. Struggle… Honestly, with so many rich blessings, how could I have any struggles, but probably the greatest is balance…balance in trying to get everything done that I want to get done. I get a lot done, but it seems it is never ever enough. Truth… Trust God when he tells me to take a seemingly non-straight-line turn because he may have a far greater plan or objective that I could never have imagined; beware of pride’s deadly elasticity or fear’s paralyzing panic; thus it is neither pride, nor panic; arrogance, nor fear that ought to drive a man, but a stilled trust in the sovereign Creator of the universe’s magnificent presence, glory, greatness, power, love and deliverance. Application… Despite my very elastic and foolish arrogance, as well as, my paralyzing fear at times, God promises to deliver me to my ultimate calling and destiny. Everyday is a day of ongoing Spiritual discovery, learning, disappointment, failure and growth. Like Moses, I am seeking to lead God’s flock to its promised land or Spiritual destiny by hopefully and continually both living and teaching that our only hope every day each day is the willingness….the almost blind willingness to both reach out for God’s help and leadership and to trust it when we receive it. Nothing more and nothing less.